Ten DGFC members have been trained and appointed by the SWD as Honorary Wildlife Wardens. We systematically monitor a corridor of forest within the LKWS and report any unusual or illegal activities, inside and outside the corridor, to the relevant authorities. These activities include hunting, logging and pollution, among others. DGFC has established 20 botanic plots around the vicinities of the field centre and of Sukau village comprising a range of forest types. An open access DNA barcode reference is being created to assist with the identification of adult and sapling trees and to allow the investigation of plant-animal interactions in the future, and to attempt the regeneration and recreation of different types of forest within currently deforested areas. We regularly form brigades to keep the Kinabatangan River clean. 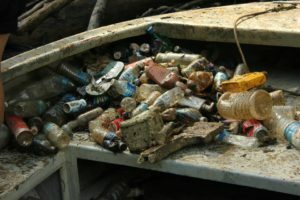 The main rubbish found consists of different forms of plastic, glass, tin, polystyrene and various other materials. Please don’t litter and help keeping the environment clean.